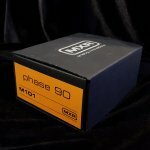 MXR M-101 Phase 90The MXR M-101 Phase 90 Pedal gives you classic phasing with variable speed control. Add shimmer to lead passages or jet-plane resonance to muted strumming. Not just for guitars; it works well with bass, keyboards, and even vocals. Vary the speed from a subtle, long cycle to a fast, watery warble with endless vintage vibrations in between. The MXR M-101 is powered by single 9V battery or Dunlop ECB-003 AC AdapterMXR M-101 Phase 90 Pedal Features: * 2-3/8"W x 4-3/8"H x 1-1/4"D * 1 lb.